This hook and eye strap makes it easy to expand the size of a torselette, bustier or bra. Colours: white, ivory and black. Note: The article number depends on the number of hooks and eyes. For example, H-12 has 12 hooks and eyes. Shapers Hook and Eye Strap. This hook and eye strap makes it easy to expand the size of a torselette, bustier or bra. Available in White, Ivory and Black. Available: H-01, H-02, H-03, H-04, H-06, H-07, H-08, H-12,..
Shapers Hook and Eye Strap. This hook and eye strap makes it easy to expand the size of a torselette, bustier or bra. Available in White, Ivory and Black. This item has 2 hooks and eyes. Available: H-01, H-02, H-0..
Shapers Hook and Eye Strap. This hook and eye strap makes it easy to expand the size of a torselette, bustier or bra. Available in White, Ivory and Black. This item has 3 hooks and eyes. Available: H-01, H-02, H-0..
Shapers Hook and Eye Strap. This hook and eye strap makes it easy to expand the size of a torselette, bustier or bra. Available in White, Ivory and Black. This item has 4 hooks and eyes. Available: H-01, H-02..
Shapers Hook and Eye Strap. This hook and eye strap makes it easy to expand the size of a torselette, bustier or bra. Available in White, Ivory and Black. This item has 6 hooks and eyes. Available: H-01, H-02..
Shapers Hook and Eye Strap. This hook and eye strap makes it easy to expand the size of a torselette, bustier or bra. Available in White, Ivory and Black. This item has 7 hooks and eyes. Available: H-01, H-02..
Shapers Hook and Eye Strap. 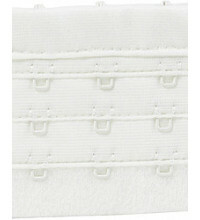 This hook and eye strap makes it easy to expand the size of a torselette, bustier or bra. Available in White, Ivory and Black. This item has 8 hooks and eyes. Available: H-01, H-02..
Shapers Hook and Eye Strap. This hook and eye strap makes it easy to expand the size of a torselette, bustier or bra. Available in White, Ivory and Black. This item has 12 hooks and eyes. Available: H-01, H-0..
Shapers Hook and Eye Strap. This hook and eye strap makes it easy to expand the size of a torselette, bustier or bra. Available in White, Ivory and Black. This item has 13 hooks and eyes. Available: H-01, H-0..